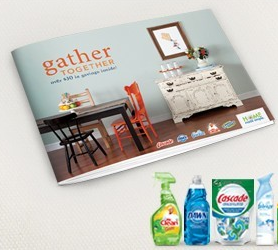 Request your “Gather Together” Coupon Booklet from P&G. These booklet is worth over $35 and has coupons for products like Dawn, Mr. Clean, Febreze, Swiffer, and other P&G products. This coupon booklet is FREE and will be mailed directly to you (no printing!). These booklets usually have higher value coupons than you find elsewhere, so I always keep my eyes peeled for a new one. Even if you have received another Home Made Simple booklet, you should be eligible to receive this one.